Before you bring home your kitten, take time to do a temporary home makeover that will keep your new feline friend out of surprisingly dangerous situations within your home. 1. Inspect your home from all angles. Go room to room and view from a kitten’s perspective. That includes getting down on your knees and targeting possible cubby holes he can escape into and also looking up high to make sure he won’t be perched on top of your refrigerator or on a high shelf that displays breakable heirlooms. 2. Protect your rugs and sofa. Temporarily remove any cherished rug and place covers on your sofa to prevent your kitten’s need to scratch from turning these items into shreds. 3. Head to the hardware store. Kittens are keen on being nosey and they thrive on investigating their surroundings thoroughly. Purchase childproof latches and attach them to cabinets that harbor cleaning supplies, food and other canine temptations. Encase any wires from electrical devices like televisions and computers in chew-resistant PVC casings. 4. Stop at the pet supply store. Felines fancy vertical spaces and need to scratch, so invest in a sturdy cat tree that offers a comfy perch as well as areas for the cat to scratch horizontally, vertically and at an angle. Locate this cat tree in a high-traffic area, such as your living room or den to make it more inviting for your social cat than your furnishings. Also choose an easy-to-clean carrier with openings at the front door and top. Keep the carrier’s door open, place a comfy towel inside and occasionally, feed your kitten inside to make the carrier more inviting – and trips to the veterinary clinic less yowl-filled. And purchase low-level litter boxes filled with litter to a depth of about 2 inches to make them more accessible to your young feline. 5. Dedicate a kitten-safe zone. 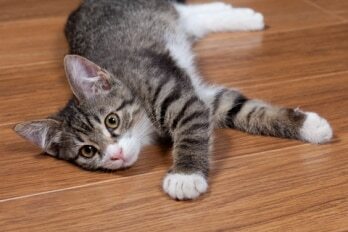 Resist giving your kitten free roaming rights throughout your home. Introduce him first to a large bathroom or spare bedroom that you have converted into a safe kitten haven. Visit him often for the first few days as he acclimates to his new home. 6. Keep a neat home. Kittens definitely make you become a tidier housekeeper. Save on expensive visits to the veterinarian caused by your kitten eating something potentially toxic to him by removing any small items on tabletops that can be chewed and by stashing kitchen and bathroom trash in cans with secure lids. Stash small items like needles, thread, hair ties, jewelry and coins out of paw’s reach. Get in the habit of completely closing all closet, bedroom and bathroom doors to prevent any feline misadventures. And, training all members of your household to keep the toilet lid down. 7. Let’s see some ID. Before you take your kitten from the adoption center, make sure he is fitted with a collar and an identification tag that includes your name and cell phone number. And ideally, make a detour to your veterinary clinic to have your kitten receive his initial physical examination and receive necessary vaccinations and be microchipped. Final advice: Capture your kitten’s fun-filled first year with photos and videos you can post online to your friends. Trust me, that year will fly by and you will be amazed at how much your kitten has grown.